When a couple separate there are often financial and property issues to be discussed and agreed. A mediator can help you do this in mediation. A mediator will help you clarify details of your financial position, this could include; The division of capital and assets eg. bank accounts, savings and pensions. Property issues could consider matters which include the family home, mortgage / rental agreements, contents of the home and cars. This list is not exhaustive. 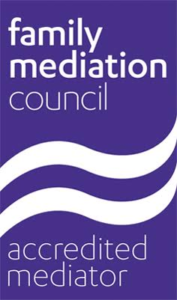 The mediator will also help you decide on issues to do with child support and maintenance. The mediator will help you explore and consider options that are available to you with consideration to your needs and expectations for your future. For instance, is the house to be sold now or at a future stage? How do you divide the proceeds?This agreement will be put in writing but it is not legally binding. You can however, consult a solicitor about the final agreement, which can be formalised into a legally binding document. It is the role of a mediator to ensure that you fully understand each other’s financial situation and needs prior to any proposals being reached. To enable you to receive independent legal advice upon any proposals before they are made into a court order. To write your final agreement and ensure that all documents have been fully disclosed to the other party and evidenced within the agreement.